Alligators in the backwoods of the Big Cypress Swamp grow at much slower pace then canal alligators. Canal alligators have plenty of fish, turtles, snakes and water birds to feed on. The backwoods source of food is much more meager. Living on the occasional snake, raccoon, possum or water bird they can ambush, they just don't have the same amount of available food source that canal alligators have. 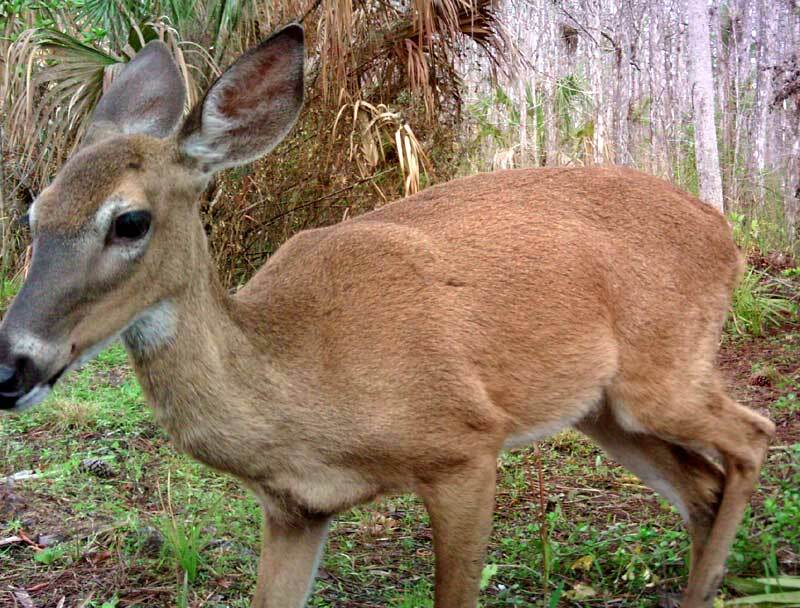 This has been worsened in past few years as the proliferation of the Florida panther in the Big Cypress Swamp has decimated the existence of small animals. The alligator in the picture to the left is big compared to most you will see in the backwoods of the Big Cypress Swamp. 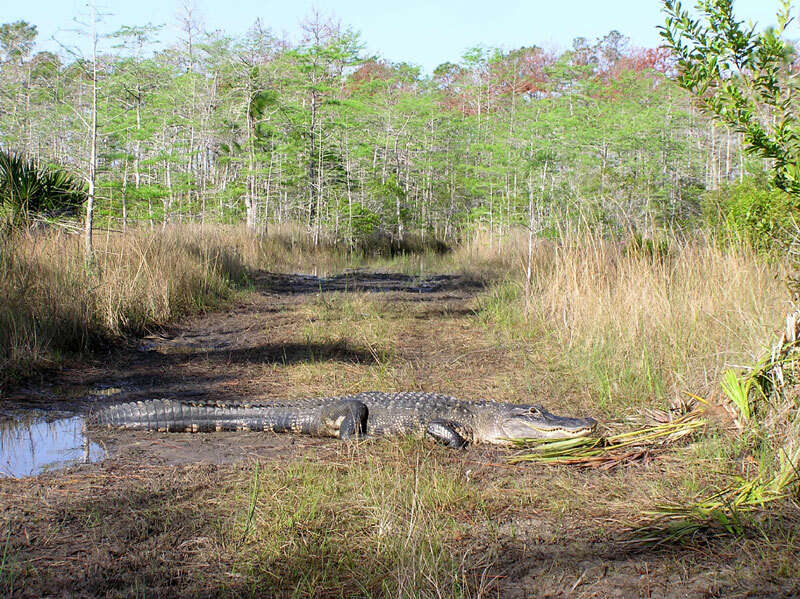 The alligator shown to the right is a more normal size alligator in the Big Cypress Swamp, (less then half the trail width). About two thirds the length of the one in the picture above, it is still a toothy creature that will bite you if it gets a chance. It pays to be aware when you are walking around. 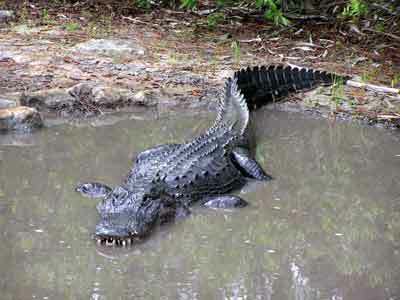 While the backwoods alligators are wary of man, you certainly would not want to step on one in a muddy pond of water. 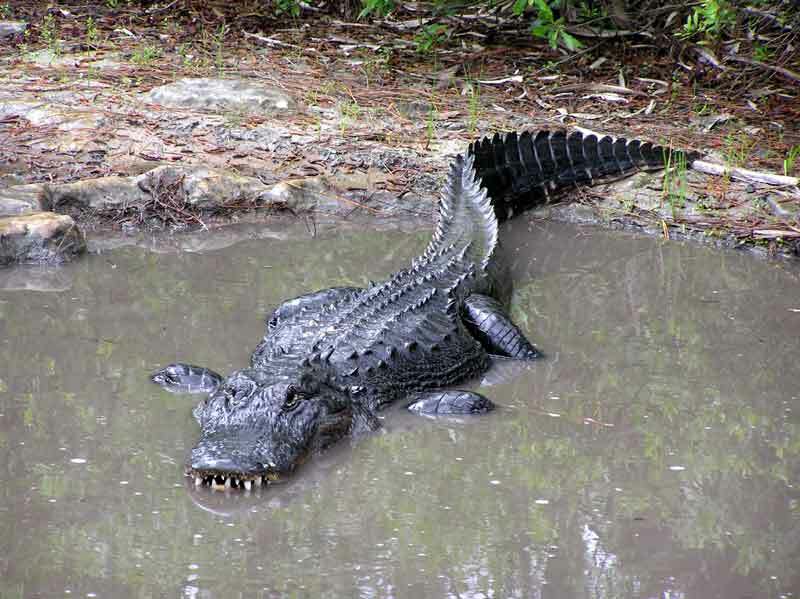 The backwoods alligators are a hungry lot in recent years and are a little more aggressive than they used to be. It pays to give them a little more room when passing them by now a days. They can be anywhere. 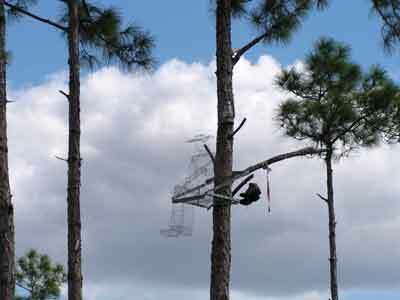 I have run into more than a few, in pine and palmetto uplands. Here is a close up encounter with a young deer. It was investigating the game camera, when it took her picture. You can see the tense posture of the deer examining the camera. 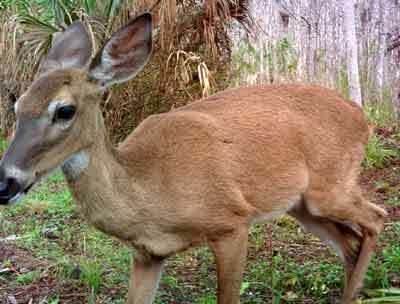 Deer are curious creatures and will move closer to things they have not encountered before. That is why fawns need their mother to teach them the things to be afraid of and the things that are ok.
All the deer moms out there, be sure to teach your fawns to be afraid of man. Man is the most dangerous thing you will encounter, because they are unpredictable and can reach you at a far distance. Panthers are a close second, but they must get much closer to do you harm, giving you a chance to see them first. 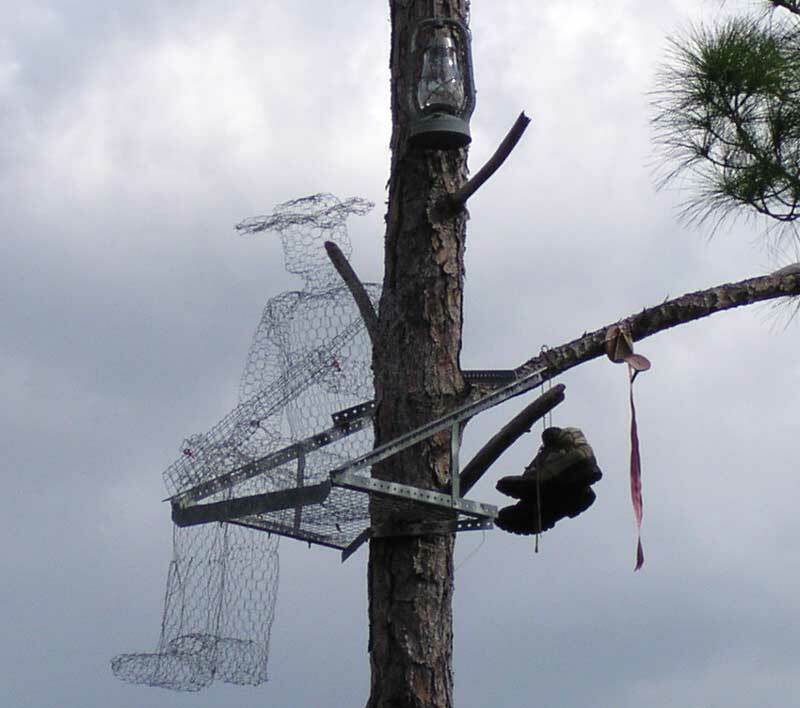 At a well know spot along Buckskin Prairie, for over a year a gladesman ghost watches over passersby's. Hardly noticeable this armed ghost keeps a watchful eye over this traditional spot, that gladesmen use as a remembrance of the gladesmen that have come before them. Lit at night by a lantern, the ghost watches into the night, monitoring animal and people alike. It would be considered disrespectful to the gladesmen culture to remove or harm this ghost that guards this traditional place. Those that do will be identified. A hidden game camera monitors those who might wish him harm. "Backcountry Volunteers are trained in the use of Off-Road Vehicles (ORV) and travel along backcountry trails that allow for ORV use assisting and educating visitors as needed." 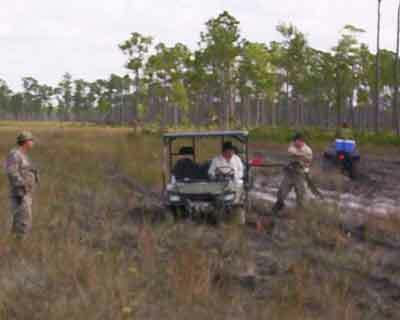 Here are a couple of wintering in Florida, trained Backcountry Volunteers, getting assisted out of the mud and put back on trail, by some traveling Gladesmen. The National Park Service UTV is not quite up to traveling across prairies during the transition from the wet season to the dry season when the mud is really slick. The Gladesmen after assisting them, reminded them to stay on the marked trail (marked being a rather loose term, since the markers mark mostly closed trails and not exactly where the approved trails are for ORV travel). The gladesmen don't want to be blamed for ruts on prairies, made by backcountry volunteers.